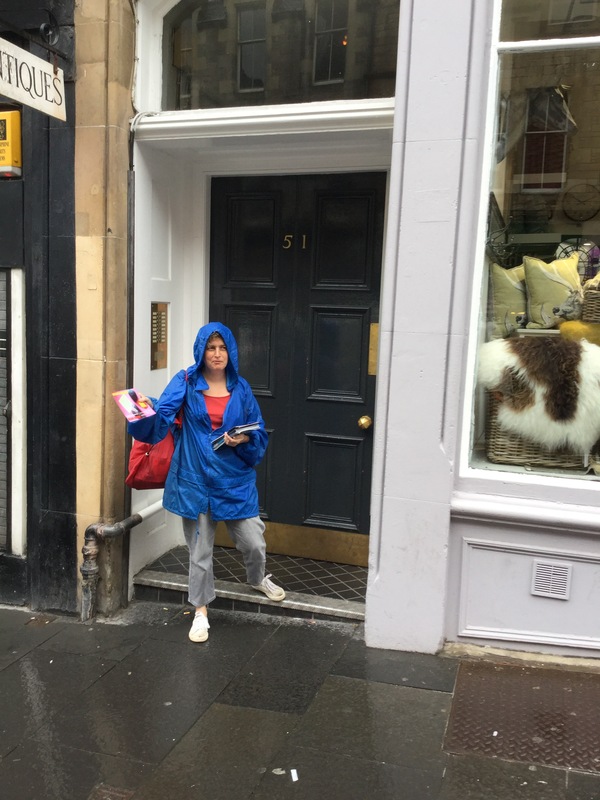 So I was in the Edinburgh fringe for a week and while it all started in a naff kind of way, with my luggage and flyers not arriving, things ended up going pretty well. In fact something weird happened which I’d never even considered before I left. I actually had five minutes of fame! OK, I may not have had big audiences, but I did have five minutes of fame. A couple of months ago I wrote a joke, a silly one-liner. I normally have a process for writing jokes, which is to come up with the punchline first, but this one arrived fully formed. I was sitting down on my bed when I thought of it. Yes, I can even remember what I was doing when the joke arrived! I incorporated it into my regular set and tried it in a few places, married as it was to a ‘bit’ that I do with a poem supposedly written the night before and stapled to a crisp packet. (That’s how weird my life is . .). It got good laughs but I didn’t think much more of it. As a matter of course, or rather, as an aside, I added it to my Edinburgh show. The first day I was there a call went out to submit jokes from shows to a newspaper reviewer, which I duly did with a very apologetic email, which I ended with the words, ‘I can hear you laughing from here’, which I’d meant to be a sarcastic sign off. I then completely forgot that I’d done this and I tried to get through a tough first day with no costume, technology, flyers or posters. The second day went well and I had a great audience. I was so happy with the audience that I went and had a celebratory Scottish breakfast. I wasn’t happy with my performance that day, though, and I texted my friend Melanie Branton to say that I would go back to my flat and rehearse all afternoon. I had to tech Dan Simpson ‘s show that night, so I needed all the rehearsal time I could grab. A few minutes into rehearsing, I got a message from Jo Mortimer to say that I’d been mentioned on the Guardian website. And indeed, there it was. The joke! Oh, that’s nice, I thought. I also felt guilty as I’d forgotten to do the joke in the show that day. And then things went manic. Over a thousand people looked at my website over the next two hours. Twitter went into meltdown as people quoted the joke and tagged me. I left to tech Dans show and when I got back there were hundreds of social media notifications. Oh good, I thought. Maybe I won’t have to do much flyering tomorrow! The only trouble was, the article did not link to my show, there was no way that people could find Juicy through the article. The next day was crazier still. The print copy of the Guardian came out, and the joke was read out on Radio Two during the breakfast show. Other websites began quoting the joke. I’d just gone out to start flyering when I was contacted by Radio Five Live. Would I go live on air and chat about the joke? Sure, I said. So instead of flyering, I was back at my university flat talking on the radio to researchers and then the host herself. And again, they did not mention the show. The show that day was not well attended. I’d done hardly any flyering, though two people were there who’d done a bit of detective work and wanted to see what all the fuss was about. The tag line I used on social media while publicising the show was ‘come for the joke, stay for the poetry’. By the end of that day the joke had been mentioned on the Daily Telegraph website, and then the next day it was printed in The Mirror along with Tim Vine’s joke, as well as the Western Morning News and god knows where else, I couldn’t keep track. My own website had more visitors over three days than it normally gets in a year. and then it all kind of calmed down. Visits to the website dropped away, and by the Saturday, the joke was more or less forgotten. My five minutes of fame had gone. I’m so glad it happened, though. Not least that I can use this in publicity on flyers and things. When I got back to Devon my parents gave me a joke book, because apparently this might help with my ‘stage act’ and that I might be able to ‘read them out to the audience’. And friends and work colleagues keep telling me jokes and funny anecdotes and end by saying, ‘you can use that in your act if you like’. But apart from that, everything is fairly normal now and it’s like it never happened at all! 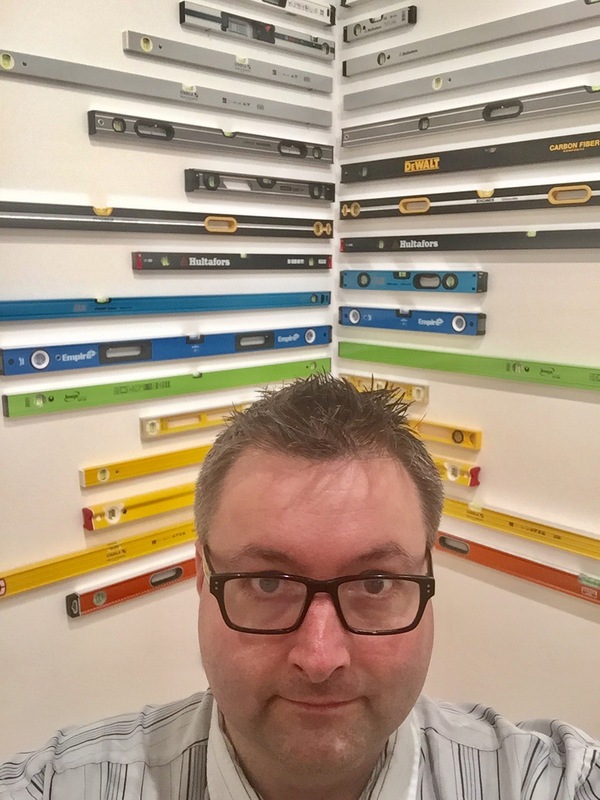 Author Robert GarnhamPosted on August 28, 2017 Categories art, performance, poem, poet, poetryTags art, comedy, conceptual, culture, edfringe, edinburgh, fringe, fun, funny, humour, lgbt, literature, performance, performance poetry, poem, poems, poet, poetry, Robert Garnham, slam, spoken word, theatre, writer, writingLeave a comment on I told a joke. Well what a week this has been. I arrived in Edinburgh with no luggage and no ability to put on a show. The only clothes I had were the tshirt and shorts I’d worn on the airplane. Not even Amy spare pants. I booked into my student flat feeling totally dejected. Last year I’d arrived and lost my passport and I was so sure that things would be better this year. By the middle of the week I’d been in The Guardian, mentioned on Radio Two, and interviewed on Radio Five Live! The show had gone very well and I’d won the Hammer and Tongue slam one evening. It’s all so different to last year. 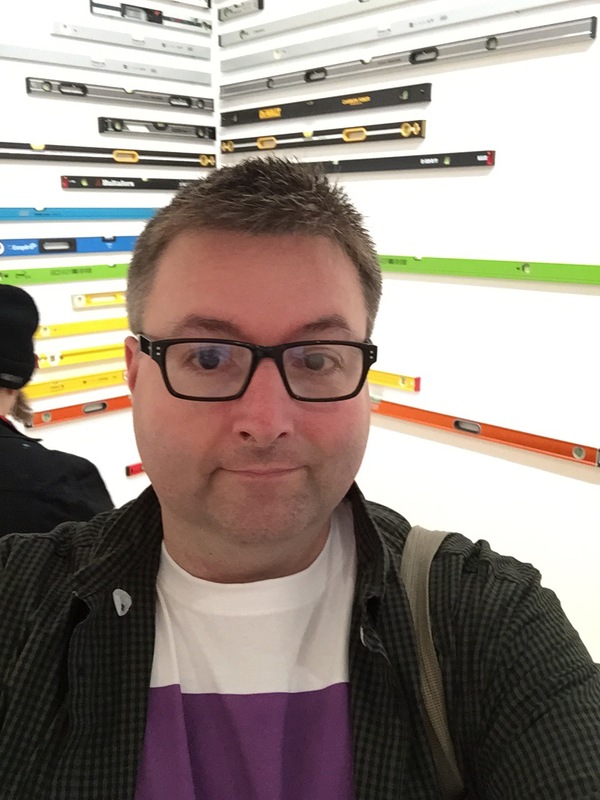 I wrote a blog earlier this year about last year. I felt so dejected that I’d even considered giving up spoken word entirely, and when I’d featured at Boomerang Club on the last day of the fringe last year, I’d gone into it convinced that this would be my last ever performance anywhere. I also had no money. By which I mean, I have a seperate account for spoken word things, and it was completely empty. The night I went to see Dandy Darkly was the night I withdrew the last reserves. I made nine quid from the audience of my final show, though. A year later I’ve headlined in New York, appeared on a tv advert, done a lot of corporate work, and other private gigs which have allowed me to come to Edinburgh this year better prepared. I’ve also had a lot of help from people. One of the top fringe performers from last year was generous with his time and spent a couple of hours taking me through everything about putting on shows, so long as I didn’t reveal who he was. I’ve also had technical help from Bryce Dumont with the music, directorial advice from Ziggy, and fantastic sound clips from Jackie Juno and Margoh Channing. However, the biggest support has come from Melanie Branton, perhaps my closest friend on the spoken word scene, who has been there at every step of the way showing me how to do absolutely everything, from flyering and chatting to strangers, to how to structure a show. Melanie has been a huge inspiration this last year, and it’s such a comfort in a city of strangers to see her. Which makes tonight somewhat awkward, as I’m going head to head with her in a poetry competition! My last shows are today and tomorrow and I’ve got loads of ideas for next year. I just need to get over my hatred of flyering! The question arises: am I the least ambitious Edinburgh fringe performer in history? It’s Monday morning and I’m sitting in a coffee shop in Scotland’s capital, about to go out flyering, yet I’ve already achieved everything I wanted from the fringe. I have performed Juicy. If I have a week of no shows and missing audiences, I have already hit my target, which was admittedly not very adventurous. 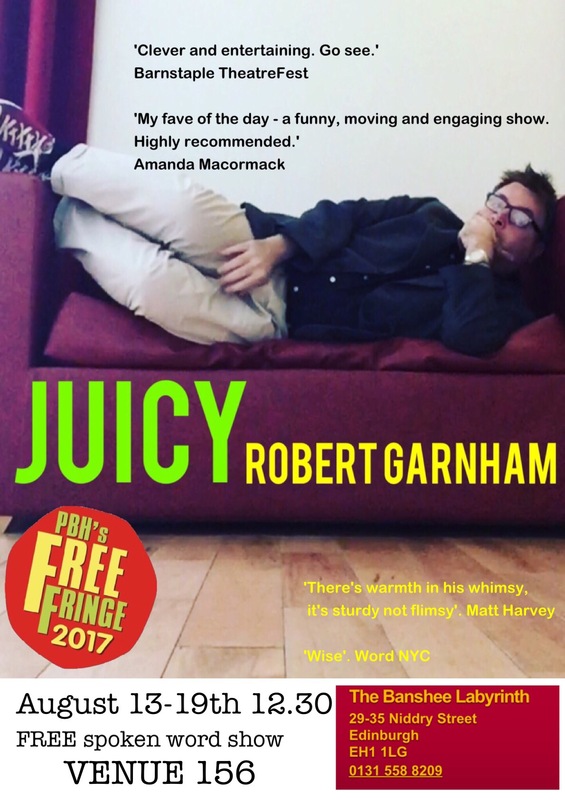 I’ve performed Juicy at the fringe. Just getting here has been an adventure. I arrived on Saturday afternoon, but my luggage didn’t. And in my luggage were all of my flyers, posters, technical equipment, costumes, music stand, everything I needed for the show. As luck would have it, the luggage turned up on the Sunday afternoon, waiting for me at my student accommodation, but I had to do the first show with no props or music or costume. These sorts of things are character building. The thing is, I really hate flyering. I’m awful at it. I hate speaking to people at the best of times. I hate doing linking material in between poems and it’s taken years of practise just to do the very small amount of material I now have. Talking to people, making eye contact, all that kind of thing, goes against the my Surrey suburban upbringing of being ever so polite and never being an inconvenience. Yesterday I had two valuable lessons. The first was from Melanie Branton, my closest friend in the spoken word world and one of my inspirations as a performer. She showed me how to flyer successfully, where to stand, how to stand. How to do it. She even helped me for a short while and I was ever so grateful. I go in to Today now knowing more than I did. The second lesson came from Dan Simpson, whose show I am tech-inn for the next few days. He told me his method of getting as many guest spots as possible at poetry, comedy and cabaret nights, anywhere where people might see you. So I’m hoping for bigger audiences for the rest of the week but I have already reached my target, so anything is a bonus from now on. I’ve got thousands of flyers to give out, so my inspiration at the moment is not having to lug them back to Devon! And meanwhile, I’m having the most amazing time! I’m really looking forward to Edinburgh! Last year I went to the Edinburgh fringe with my show, Static, and lots of things happened simultaneously. I lost my passport on the first day, (I was due to fly to New York just a few weeks later), didn’t know where my accommodation was, and I had a show that depended on a lot of mime and movement and moments of silence, that was put in the corner of a noisy bar. I became very philosophical while I was there, but by the end of the run I was questioning everything and I was ready to consider giving up on spoken word. The usual fringe madness, then. Last year was a learning experience. I went in softly with Static, an autobiographical piece which I’m still proud of. Indeed I performed the show one last time earlier this year. But on the whole the experience had been a negative one, and I wrote about it in a blog. This year, I feel completely different. I have a brand new show, Juicy, which is a completely different beast. Rather than set out with a story and an idea, I just opened up my mind and threw everything at it. The result is a show which has the potential to be different every day, with different poems and different linking material. It’s adaptable, loud and doesn’t rely so much on props and long quiet set pieces. It’s also, I hope, very funny. But the other thing that’s different this year is that I know more. I know exactly where my accommodation is, I know how it works, I have the travel all sorted out, and I’m pretty sure that I’m not going to lose my passport. The other difference is that my venue is more suited to the kind of show I’ve written, and I’m really looking forward to performing at Banshees Labyrinth every day. Last year, I didn’t know what my venue was like until I arrived, late, breathless, straight off the plane. This year, I know everything about the venue, and I shall be there a day before. A lot of people helped me over he last year get the new show together, too. 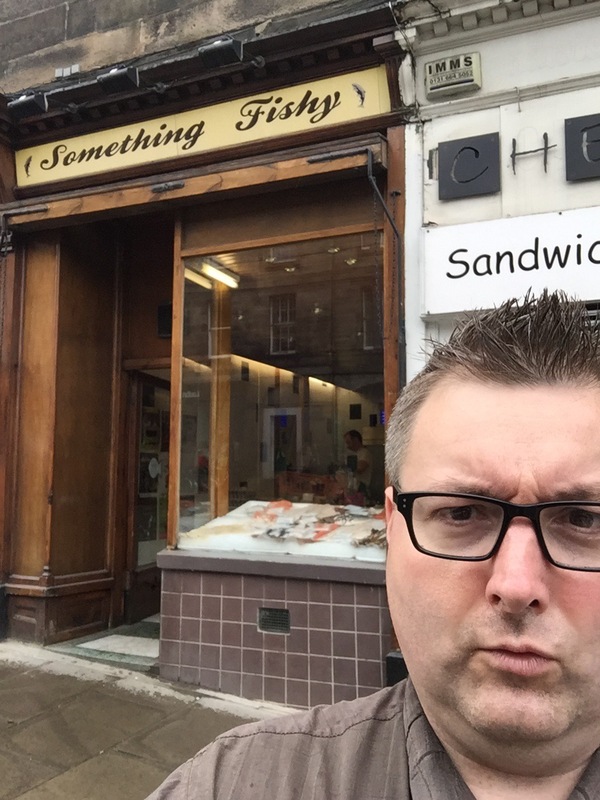 At the end of the fringe last year I had a breakfast meeting with one of the top fringe performers, who was good enough to impart all of his wisdom, which I have used to make this show. In particular he told me the importance of music, and this is where my long time colleague Bryce Dumont comes in. He’s helped create a soundscape for me to perform against, and made me familiar with the technology to do this. There has also been support from Melanie Branton, Jackie Juno, Margoh Channing and the mysterious fringe performer, all of whom have offered advice and their own voices for the soundscape of the show. But the biggest difference this year is that I will know more people there. More friends than ever will be up there with their shows and I aim to see all of them, perhaps several times! So I’m looking forward to Edinburgh this year! Author Robert GarnhamPosted on August 2, 2017 August 2, 2017 Categories art, performance, poem, poet, poetry, surrealism, UncategorizedTags art, comedy, conceptual, culture, edfringe, edinburgh, fringe, fun, funny, grammar, humour, lgbt, literature, London, performance, performance poetry, poem, poems, poet, poetry, publishing, Robert Garnham, slam, slam poetry, spoken word, theatre, writer, writingLeave a comment on I’m really looking forward to Edinburgh!